NEW YORK (CNNMoney) -- U.S. stocks capped off a solid week on either side of the break even line Friday, as investors hesitated to make big bets ahead of a key vote on a second bailout for Greece. The Dow Jones industrial average (INDU) rose 46 points, or 0.4%, closing at the highest level since May 2008. The S&P 500 (SPX) edged up 3 points, or 0.2%, and the Nasdaq (COMP) lost 8 points, or 0.3%. Investors are optimistic that European finance ministers will sign off on Greece's latest economic reform proposal when they meet Monday. Their approval is needed in order for Greece to receive bailout funds and avoid default on a €14.5 billion bond redemption in March. But until they receive official word, investors are taking a breather going into the long weekend and Monday's big meeting. "From an investor's perspective, European leaders have over-promised and under-delivered over and over for the past several months," said Michael Sheldon, chief market strategist at RDM Financial Group. "Until we see some signatures on a dotted line, there are still questions about Europe's ability to contain its issues." Friday's muted moves came a day after the stocks gained more than 1%, with the Nasdaq closing at a decade high. All three indexes posted solid gains for the week. 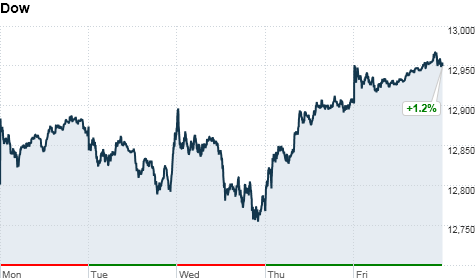 The Dow rose 1.2%, while the S&P 500 added 1.4%. The Nasdaq jumped nearly 1.7%. For the year, the Dow is up almost 6%, and the S&P 500 is up more than 8%. The Nasdaq has made an impressive 13% run. "All the economic data recently has been pointing to a rebound in economic growth, which has propelled stocks higher," said Sheldon. "But the market might be getting ahead of itself from a sentiment perspective, so it may be due for a pause or a brief pullback." But as long as economic data continue to come in strong, and Europe continues to work toward a solution for its problems, the market should trend higher in the months ahead, said Sheldon. Markets will be closed Monday for Presidents Day. World markets: European stocks finished modestly higher. Britain's FTSE 100 (UKX) added 0.3%, the DAX (DAX) in Germany rose 1.4% and France's CAC 40 (CAC40) gained 1.3%. Asian markets ended higher. The Shanghai Composite (SHCOMP) edged up slightly, the Hang Seng (HSI) in Hong Kong rose 1% and Japan's Nikkei (N225) popped 1.6%. Economy: The Consumer Price Index rose 0.2% in January, after holding steady the two months prior. Analysts were expecting a rise of 0.3%. Core inflation rose 0.2%, compared to estimates for 0.1% uptick. The Conference Board's Leading Economic Indicators index ticked up 0.4% in January, a bit less than forecasts for a 0.5% increase. Companies: Shares of H.J. Heinz (HNZ, Fortune 500) moved higher after the company beat earnings estimates, thanks to growth in emerging markets. Campbell Soup's (CPB, Fortune 500) stock also edged higher after the company's second-quarter profit declined but still managed to beat forecasts. Nordstrom (JWN, Fortune 500) shares were lower after the retailer issued a disappointing profit forecast for the year. Baidu (BIDU), China's top search engine, beat fourth-quarter earnings and sales estimates, but shares edged lower as the company issued a disappointing first-quarter revenue outlook. Gilead Sciences (GILD, Fortune 500) shares tumbled after the drugmaker said that the majority of patients involved in a hepatitis C treatment experienced a relapse within four weeks of completion. Shares of Brightcove (BCOV), known for its Internet video platform, surged more than 35% in its stock market debut. The company's shares were priced at $11 in its initial public offering, and soared above $15 on Friday. McNeil, a Johnson & Johnson (JNJ, Fortune 500) company, is recalling more than half a million bottles of Infants' Tylenol because of consumer complaints about the difficulties of using the dosing system. Oil for March delivery gained 93 cents to settle at nine-month high of $103.24 a barrel. Gold futures for April delivery fell $2.50 to settle at $1,725.90 an ounce. Bonds: The price on the benchmark 10-year U.S. Treasury fell, pushing the yield up to 2.01% from 1.99% late Thursday.